This year’s MEDTECH INNOVATION COMPETITION, organised by the Biomedical Engineering Program @ USYD in conjunction with the Westmead Precinct Development Group is taking place this Friday 3rd November. 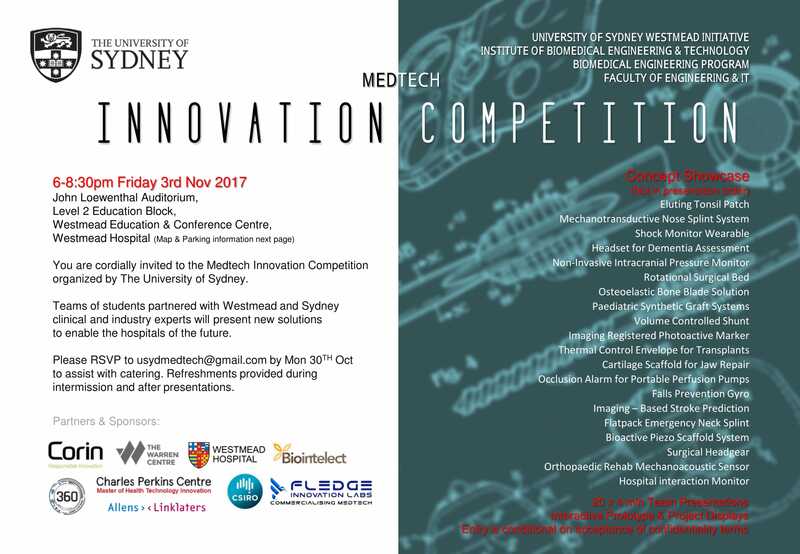 The competition will include 20 clinician-guided student teams presenting innovative medtech solutions. Prototypes & demonstrations will be exhibited on the night. The projects are guided by Concord Neurosurgeon, A/Prof. James van Gelder, and other clinical and industry experts. The Sydney Spine Institute brings together multiple specialists who are expert in managing spinal conditions. We are active in the education of doctors and allied health professionals in the latest evidence-based treatments of spine conditions. The Sydney Spine Institute is located in the Burwood business district close to transport and parking. Sydney Spine Holdings Pty Ltd © 2014. All rights reserved.